Not everyone can afford or want, for that matter, a luxury car. But some of us just can’t resist sleek design, great performance or-let’s be honest-the brand name. Every industry has its own luxury segment and roofing is not an exception. When it comes to roofing materials such as shingles, top quality products have many advantages. In fact, investing in a top-of-the-line roof is a lot easier to justify than buying a luxury car. 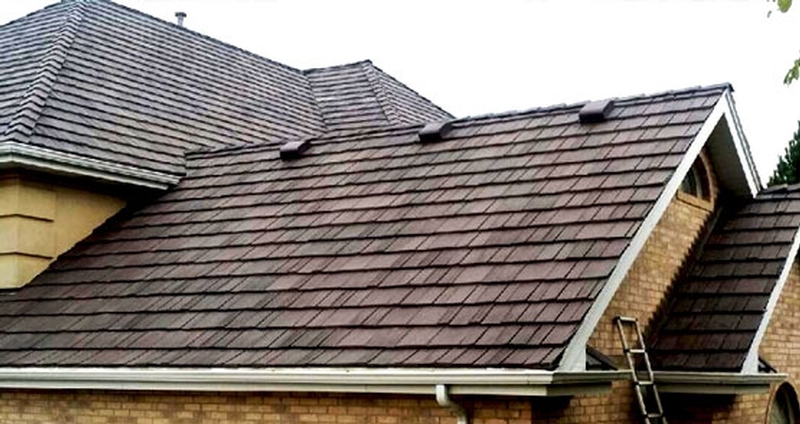 New types of premium shingles offer not only longevity and enhance the appearance of your home, but in many cases can be considered a greener alternative to what was traditionally regarded as a luxury roofing item, such as cedar shake shingles. The small but growing category of synthetic roofing products caters to homeowners, builders, and remodelers who prefer renewable resources but want the look of slate or shakes. Even for those who are more interested in durability and longevity than in environmental friendliness, synthetic roofs can be a good choice. Advanced materials and manufacturing technologies give the synthetic products better resistance to weathering, greater durability, and longer lifespans than real slate or cedar, according to manufacturers. Synthetic slate and shake products are manufactured from a variety of materials, primarily polymers and/or rubber along with fillers and modifiers. Although the products seem very similar, formulations vary among manufacturers. The polymeric composition of most synthetic shingles and shakes generally includes advanced UV inhibitors and impact modifiers. Some products incorporate ingredients such as recycled rubber or plastic, mineral dust, or cellulose fibers, while others use virgin rubber and plastic. The majority of the synthetic slates and shakes are backed by 50-year warranties. Most are UL-certified for Class 4 impact resistance, and many, but not all, also achieve a Class A fire resistance rating. Furthermore, some are rated to resist uplift in high winds. The question of whether synthetic roofing products have green characteristics must be answered on a product-by-product basis. They are all polymer-based, which means they are made from a petroleum-derived material. Some synthetic slates and shakes are manufactured using recycled content and some are not. Those that contain recycled content typically use high-quality post-industrial materials from automotive and other industries, but a few incorporate a small amount of post-consumer content such as recycled tire rubber. A long life expectancy–supported by extensive industry testing for UV resistance, low water absorption, and resistance to freeze/thaw cycles–means that roofs don’t have to be replaced every 15 to 30 years, and there are fewer repairs during the roof’s lifetime. Even products that do not use recycled content can be considered somewhat green because they are polymer-based and a majority can be recycled at the end of a roof’s lifespan. Lately, we’ve became big fans of DaVinci cedar shake and slate shingles. They are arguably the most beautiful and the most complex, and, therefore, closest to the “real thing.” They will enhance the appearance of any Chicago area property. Developed with a state-of-the-art polymer chemistry, DaVinci polymer composite roofing tiles are not only beautiful but durable enough to protect and enhance the value of your home. DaVinci roofing materials come in 50 standard colors. Their revolutionary polymer roofing tiles offer homeowners and contractors the authentic colors and natural textures of quarried slate, hand-split cedar or machine- sawn shakes. DaVinci products exhibit deep surface graining and a thick profile. Their shingles feature two layers of UV protection to prevent fading and damage. They weather extraordinarily well in the rough Midwestern climate. Of all the projects we’ve completed in the Chicago area, we have not received a single complaint. Every client who chose DaVinci shingles became an instant fan.